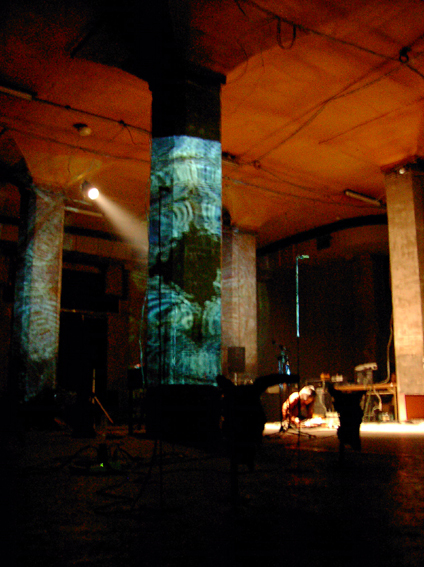 Frequency Curtain was formed in 2001 by John Grzinich, Rick Reed and Josh Ronsen, fusing Reed's ancient sine wave generators and short-wave radios with Grznich and Ronsen's modern Macintosh laptops. All three contributed video materials which became a staple for all future performances. The trio debuted at the Intersect 4 festival in Austin, Texas and the rehearsal recordings were released on Elevator Bath records, then based in Dallas. After Grzinich left for Europe, Reed and Ronsen continued as a duo, performing in Dallas, Houston and Austin. Vanessa Arn filled in for Reed at 2 shows. “Listless Mountain” on Grain CD (DotDotDot). “Axi-ohm” on Austinnitus Audio Series. Reed-Ronsen duo performing in Houston, available as free download. “Two Days in May” CD (TIBProd Italy). also available on streaming and download services. John Grzinich now works in Estonia at MoKS and releases records under the name jgrzinich. He leads workshops and records interesting environments. Rick Reed has been performing under his own name as well as Ghost Time, Voltage Spooks, Knobjobs and providing music for the films of Ken Jacobs. He also paints and makes video works. Josh Ronsen performs with brekekekexkoaxkoax, LSJ and Leaf Chimes. He also publishes Monk Mink Pink Punk. Live recordings and digital videos are available for release. Contact Josh Ronsen.